My thanks to my brothers in music, Jesús Anglas and José Navarro, in Germany. I would like to dedicate this new CD to my family in Perú, and my friends: Jackie (my Godmother) and David Kaspersin, Sharon Whaley, Chris Brazener, El Vate, Iphraín Vega, Omar (my auto mechanic), Venita, Joe, Consuelo, and Chuck, Roger and Birgit Robles, and all the people who feel the Spirit of Inca Music in their hearts. And the plants refuse to grow. Please listen to me before it's too late. I look to you for hope. That give life to the deserts. To cover us with wind and rain. Vengo de la cuna del Inca y del Sol.. 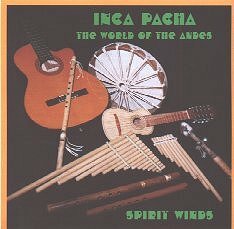 I was born in a cradle of the Inca and the Sun. Que perdieron la vida; cual fue la razon? Who lost their lives; what was the reason? Vuelvo siempre al nido donde he nacido, We always return to the nest where we were born. De muchas leyendas, que bellas que son. And many legends which are so beautiful. Cover photo: Spirit Winds by Gale Winchel. Catalog # DRK-175    Additional recordings available.